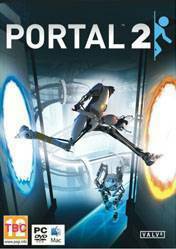 Portal 2 is a 2011 first-person puzzle-platform video game developed and published by Valve Corporation. Like its predecessor, Portal 2 primarily comprises a series of puzzles that must be solved by teleporting the player's character and simple objects using the "portal gun", a device that can create inter-spatial portals between two flat planes. The game's physics allow momentum to be retained through these portals, which must be used creatively to maneuver through the game's challenges. Most gameplay elements of the original Portal were retained in the sequel, and more were added to Portal 2, including tractor beams, laser redirection, bridges made of light, and paint-like gels that impart special properties to objects they cover. These gels were created by the team from the Independent Games Festival-winning DigiPen student project Tag: The Power of Paint. This was a rather amusing game, and I cannot emphasis just how good it is. Compared to Half-life 1 & 2, this game is full of wit and comedy as well as amazing game mechanics. This game is amazing. A real brain teaser at many times! It introduced a clever way to solve puzzles. The game had hilarious moments that I think made many laugh around the world. It's the best puzzle game I ever played.